Never mind the talents of sizzling superstars Lionel Messi, Arjen Robben, Neymar, Thomas Muller and Luis Suarez: only one man has dominated the build-up to Barcelona's Champions League semi-final tie with Bayern Munich on Wednesday. Having spent nearly his entire playing career with Barca, winning six league titles and one European Cup along the way, Pep Guardiola returned to the club as manager of the reserve team in 2007 and succeeded Frank Rijkaard as first-team boss a year later. The rest - and for once this is no mere cliche - is history. 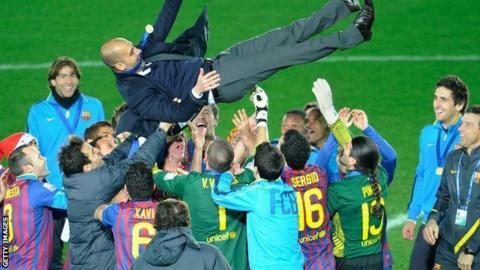 Will Guardiola beat ex-club Barca? Basing his team around the divine talents of Andres Iniesta, Xavi Hernandez and Messi, Guardiola created arguably the best team in the history of football. In four seasons under Guardiola, Barca won a staggering 14 trophies, including a pair of La Liga and Champions League doubles, in 2009 and 2011. And they did so with an attacking, attractive, possession-based brand of football which left even vanquished opponents drooling and praising their achievements. In 2012, emotionally and mentally drained by the demands of the job, Guardiola resigned and enjoyed a sabbatical from the game, living for a year in New York to pursue his cultural interests and take a complete break from football. Now, he is returning to his spiritual home for the first time, looking for his first European crown as Bayern manager. And for Barca fans the meeting with Guardiola - the game they have been waiting three years for - will present a heady mix of emotions as their team attempts to defeat the club legend many of them still idolise. In truth, Guardiola didn't single-handedly 'invent' Barcelona's short passing style of play which became known to the world, even though he dislikes the phrase, as tiki-taka. In fact, Guardiola merely adapted and enhanced an already well-established playing tradition which was first implemented by Johan Cruyff during his managerial reign at the Nou Camp between 1988 and 1996, and later continued by fellow Dutchmen Louis van Gaal and Rijkaard. Nevertheless, Guardiola took that particular brand of football to the next level, making himself synonymous with Barca's style of play. But since he left, things have changed a great deal at the Nou Camp and the team he will face on Wednesday is tactically different from the team he left behind. Messi, for starters, no longer plays in the 'false nine' deep-lying centre forward role created for him by Guardiola, instead lining up on the right wing. Furthermore, Guardiola's on-pitch representative, Xavi, is now a largely peripheral presence who will probably witness the majority of the tie in very close proximity to his former manager: from the bench. And even Iniesta, despite a magnificent assist for Neymar's opener in last month's quarter-final victory over Paris St-Germain, is a less significant figure in a Barcelona team which now relies much less heavily on patient build-up play in midfield. Instead, the team ethic under current boss Luis Enrique is based upon exploiting the explosive attacking talents of superstar trio Messi, Neymar and Suarez, who have already combined for an outrageous 108 goals this season: 51 for Messi, 33 for Neymar and 24 for Suarez. Barca have not, of course, suddenly become a kick-and-rush team and they still place great importance upon passing football. But the emphasis is subtly different, with attacking through wide areas now more fundamental than dominating the midfield. Now, it is Bayern who embody Guardiola's style, with the German team commanding a greater share of possession than any other team in the Champions League - including Barcelona. If there was one particular sign that Barca's style of play under Guardiola had become less effective, it was their humiliating 7-0 Champions League semi-final defeat two years ago… by Bayern Munich. Barca were swept away in those two contests, with Bayern's superior physicality easily seeing off their opponents in a mismatch that looked like the proverbial men against boys. After that embarrassment, Barca defender Gerard Pique ruefully noted: "We have to make some decisions," reflecting the general conclusion his team needed to change and move on from the style implemented by Guardiola. They have changed, with more dynamic performers such as Suarez and Ivan Rakitic now making a greater contribution to the team's style than the extremely technical Xavi and Iniesta. For Barcelona, then, the upcoming tie with the Bavarians provides an opportunity to banish the bitter memories of 2013 and show they have become a different, and better, team. Bayern are equally motivated and have their own points to prove after their crushing 5-0 aggregate loss to Real Madrid in last season's semi-final. And following their remarkable comeback victory over Porto in the last eight, Bayern's players will be inspired rather than daunted by the challenge of taking on their manager's former team. "It's going to be difficult emotionally for Pep but he's a professional and wants to win the game. It's a fantastic game and it could be a final. "Both coaches know each other very well because Pep was the first captain and [current Barca boss] Luis Enrique was the second captain at Barcelona. And they also worked together at Barcelona when Pep was coach of the first team and Luis was coach of Barca B." One of the many friendly and familiar faces waiting to greet Guardiola will be his opposing manager. The pair were team-mates at the Nou Camp for five years, developing a good friendship after Enrique controversially joined the Catalan club from Real Madrid in 1996. He made a perfect start as Guardiola provided an assist for him to score on his debut. They have remained close ever since, and when Guardiola was promoted from the club's B team to take over the senior squad in 2008, his replacement was none other than Enrique. They worked together for another three years, before Enrique departed for Roma. After Barca defeated PSG in the last eight, Enrique reacted to the news that Bayern had thrashed Porto 7-4 on aggregate the same night with genuine delight, expressing his pleasure to see his old friend Guardiola safely through to the next round. Now they will go head to head as opposing managers for the first time. The boardroom reception will be somewhat frostier, however. Guardiola's deteriorating relationship with then-president Sandro Rosell was one of the reasons behind his 2012 exit, and he was also angered by comments from Rosell suggesting he did not spend enough time with his former assistant, the late Tito Vilanova, during the latter's cancer fight. Rosell has now left but his successor, Josep Maria Bartomeu, was his assistant and ally. Guardiola could bring his influence to bear on the Nou Camp's presidential elections - scheduled for the summer - with a well chosen comment around the teams' meetings. A version of this feature first appeared on the BBC Sport website on 24 April.